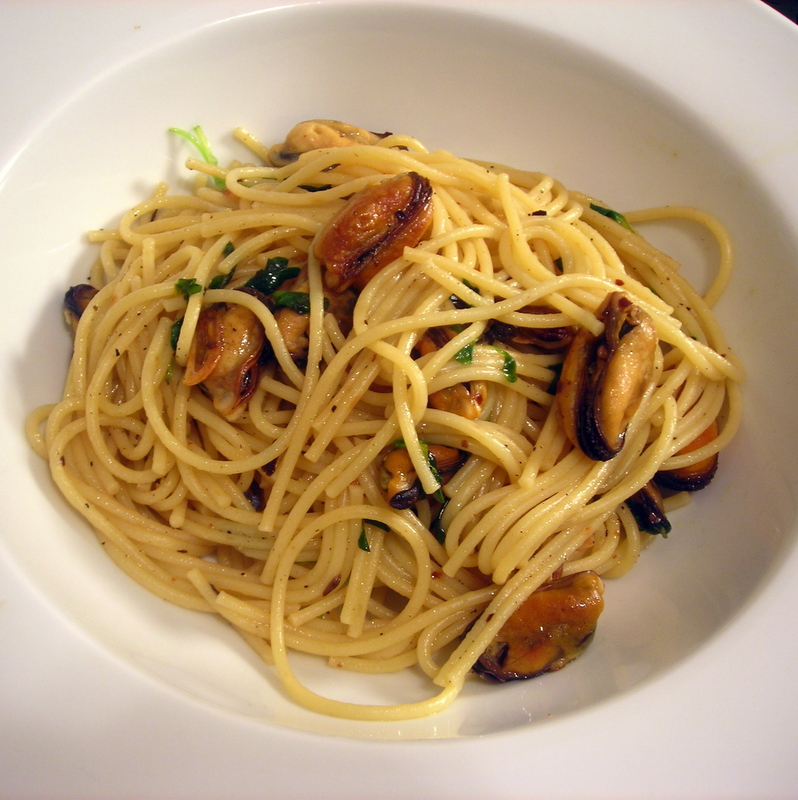 Score another one for minimalist pasta sauces: an sauce that combines mussels harvested from Long Island Sound, then steamed with a little white wine and shelled; then combined with extra-virgin olive oil, garlic, mussel juices and watercress. It’s a sauce that’s redolent of winter and of the sea. Untouched by tomatoes, it has a purity that teaches you what seafood should taste like. You can’t ask for much else than that. Prepare spaghetti according to package directions. Drain. Reserve 1/2 cup pasta cooking water and set aside. Place mussels in a large saucepan. Pour about 1/4 cup white wine over them, then cover the pot. Steam for about 5 to 6 minutes or until mussels open and are fully cooked. Discard any mussels that don’t open. Remove the pot from heat and let the mussels cool. Shell each mussel. Strain the mussel cooking liquid and set aside. Add garlic and olive oil to a cold pan. Warm oil over medium heat. Once garlic has turned a pale gold, about 2 minutes, add a small pinch of salt, a scant pinch of chile flakes and the mussels. Add watercress. Fry for 1-2 minutes. You want the cress to wilt just enough so that it becomes tender but not too much that it loses its bright green color. Add cooked pasta and toss, ensuring that the spaghetti strands are coated with the sauce. If the pasta seems too dry, add reserved pasta cooking water tablespoon by tablespoon or until the desired consistency is reached. Taste for salt and pepper, then serve at once. Serving cheese with this preparation would be a travesty, in my humble opinion. This is my entry for Presto Pasta Nights #253, a weekly foodblog event hosted and organized by Ruth of Once Upon a Feast. 29 Feb	This entry was published on February 29, 2012 at 7:05 pm. It’s filed under food, food photography, general, Italian food, Presto Pasta Nights, winter and tagged dinner, food photography, mussels, spaghetti, watercress. Bookmark the permalink. Follow any comments here with the RSS feed for this post. Thanks for all the comments and compliments, folks. And please let me know how it turns out should you happen to make this dish.